So I am using a 1.5 GHz PowerBook G4 7450 running Mac OS 10.4.11. 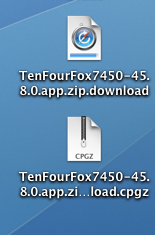 I downloaded the latest TenFourFox7450 zip file (v45.8.0). But when I double click the zip file icon on my desktop, it opens a little Downloads window in Safari with the zip file name. When I double click on that file, it unarchives it, but no new .app file appears that I am able to add to my Applications directory (I have no idea where the unarchived file goes). When I open the same file using BOMArchiveHelper rather than Safari, it generates a .cpgz zip file. No matter what I do, I can't seem to extract the actual application from the zip archive. Any ideas? Thank you very much Cameron! That resolved the issue! Cameron Kaiser closed this discussion on 09 Apr, 2017 10:53 PM.